This Week’s Poll: In honor of Memorial Day, I wanted to ask a military-themed question. Rather than go too broad and ask about war films in general, let’s discuss those that focus on the Vietnam War. I’m sure we all have friends and/or family who have been affected by this war, and there have been many excellent films based on it. My question for you this week is, what is the best film based on the Vietnam War? It seems a given that this will come down to Apocalypse Now and Platoon, but what about other excellent films like The Deer Hunter or Full Metal Jacket? How about seemingly underrated titles such as Hamburger Hill or Tigerland? Let’s hear your thoughts! Glad to see Michael and Jim take the top spots. Apocalypse Now’s a clear number one for me, followed by Platoon. I flip-flop between Apocalypse Now and Platoon, but yeah, two amazing films. Michael Scott! I so wish the finale had been about everyone going to Michael Scott and Holly’s wedding. That would have been incredible. Not a favourite category of film for me, but I would have to say of the movies I have seen about or set during the Vietnam War, Full Metal Jacket. Oh yeah, that would have been really cool to see Michael & Holly’s wedding! I was bummed that she didn’t get to make an appearance in the finale. She was the most perfect character for him. I was really happy when they got together. And I know it’s all fake, but really they were great together. Maybe even a better match than Jim and Pam! 100% agree with you. And Michael’s marriage proposal was classic, too. It’s a tough call for second place this week. Obviously Apocalypse has to be number one, but then it was a really tough choice between Deer Hunter, Full Metal and Platoon. I went Deer Hunter in the end, just cause…. I don’t know that Apocalypse Now is *obviously* #1, but it is an amazing film. I’m glad you voted for The Deer Hunter, too. That one seems to get overlooked a lot, unfortunately. I’m voting for Full Metal Jacket and Apocalypse now. Awesome to see Creed in the results! I voted for Full Metal Jacket, especially for many of the lines in the first half of the movie my friends and I have memorized. Hell of a movie right there. 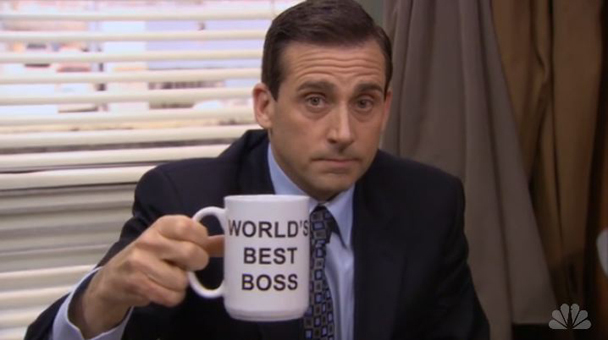 Yay, I LOVE Steve Carrell on this show! Hmmm, I don’t watch a lot of war movies so I can’t answer you. I did do a pictorial tribute for US soldiers in the movies though, and some people did mention Full Metal Jacket and Apocalypse Now. Very cool, Ruth, I need to stop by to check it out! Most of those listed Vietnam films I haven’t seen for 5 years. I’m going with Apocalypse Now & The Deer Hunter, which I’ve watched and loved multiple times. Rescue Dawn and Coming Home are underappreciated, nice they got a mention! I think I heard Tarantino praised Casualties of War. I rewatched Apocalypse Now and Platoon recently, but yeah, many of the others I haven’t seen in quite some time. I’ve heard high praise for Casualties of War, too. Need to check that out!